-Wine that has been allowed to breathe tastes better.As wine breathes,it opens up,and releases its intended aromas and flavours. -Traditionally,decanters were used to aerate wine.However,decanting is time consuming,cumbersome and inconvenient. -Hotder's design speeds up this process with ease and convenience. -Perfect aeration in the time it takes to pour a glass. 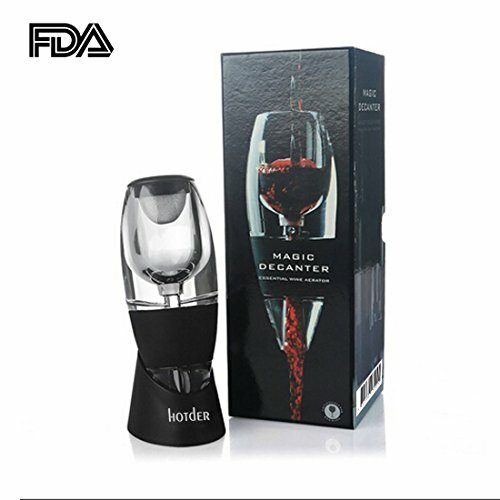 The Hotder Wine Aerator Pourer has a large aerating chamher and air intake system that utilizes the Bernoulli Effect to infuse your wine with the optimal amount of oxygen. Double the value of your wine by simply pouring yourself a glass! -Hotder draws in and mixes the proper amount of air for the right amount of time,allowing your wine to breathe instantly. -You'll notice a better bouquet,enhanced flavours and smoother finish. -It's that fast.It's that easy. LIFETIME MANUFACTURER'S GUARANTEE - To prove how confident we are in our product, we offer a lifetime money back guarantee with every purchase! If you are not completely satisfied with your aerator, we will refund your purchase with no exception!